A new PET/CT radiopharmaceutical — 68Ga-Dotatate — has just been cleared by the U.S. Food and Drug Administration (FDA) to stage patients with neuroendocrine tumors. For radiologists at Vanderbilt University Medical Center (VUMC) in Nashville, TN, this was exciting news and validation of their research. VUMC was the first U.S. site to receive an IND designation for 68Ga-Dotatate, and has been a leading research center for the drug. Results of a Vanderbilt-led clinical trial published in the May issue of the Journal of Nuclear Medicine confirmed superiority of 68Ga-Dotatate compared with 111In-penetreotide, the FDA-approved imaging modality for imaging tumors that strongly express somatostatin receptors. 68Ga-Dotatate proved to be equivalent or superior to 111In-penetreotide imaging in directing patient care for the entire patient cohort of 78. It changed treatment in 36% of participants. None of the patients experienced adverse events requiring treatment from its administration. A middle-aged patient with a well-differentiated neuroendocrine tumor resected from the terminal ileum 5 years previously has an 111In-DTPA-octreotide SPECT/CT scan demonstrating a focus of uptake in a 1 cm right lower quadrant mesenteric lymph node (arrow, A and C). There is trace uptake in a normal sized (5 mm) peri-pancreatic lymph node (B) that prospectively was read as normal. The patient was referred for resection of the single site of residual disease. Neuroendocrine tumors are a rare type of cancer, occurring in 2.5 to five people out of every 100,000. They are a slow-growing malignancy, often difficult to diagnose, and highly metastatic. Most bronchopulmonary and small intestine cases present with metastatic disease. Because a wide range of treatment options are available, accurately determining the extent of the disease using advanced imaging is critically important. Functional imaging with radiopharmaceuticals is an important diagnostic tool, outperforming CT, MRI and ultrasound. Most neuroendocrine tumors have high cell surface somatostatin receptor expression levels. 68Ga-Dotatate is a somatostatin analog with near-exclusive and high-affinity binding to somatostatin receptor subtype 2A. It has been in widespread use outside the United States for nearly 10 years. A 68Ga-Dotatate PET/CT scan performed prior to surgery revealed the right lower quadrant lymph node (D and F) as well as clear-cut intense uptake in the peri-pancreatic lymph node (E) that was read as normal. The surgical plan was changed to extent the field to include resection of this retroperitoneal node, which was confirmed to contain metastatic disease. The clinical trial evaluated the safety and efficacy of 68Ga-Dotatate compared with 111In-penetreotide imaging with respect to diagnosis, staging and restaging of pulmonary and gastroenteropancreatic neuroendocrine tumors. Principal investigator Ronald C. Walker, MD, professor of clinical radiology and radiological sciences, explained that the trial was specifically designed to provide data for the FDA to consider approval of the drug. The trial included a patient cohort of 78 consecutive neuroendocrine cancer patients who had both a 111In-penetreotide scan and a 68Ga-Dotatate PET/CT scan between March 2011 and November 2013. All scans were assessed on a per patient basis. Radiologists scored for evidence of a tumor, and an oncologic surgeon assessed the impact of care by comparing the intended treatment before and after the 68Ga-Dotatate scan. Toxicity data were also compiled and analyzed. Only three patients experienced minor adverse events. 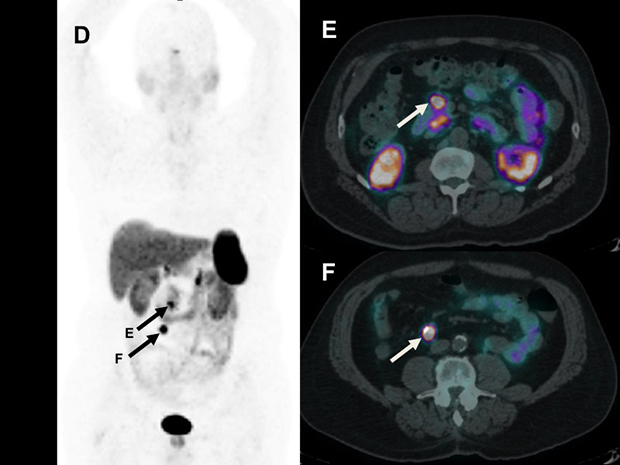 The 68Ga-Dotatate PET/CT scan combined with CT or liver MRI changed care in 28 patients, with a major change for 19 patients because additional metastatic disease was detected. The scan also demonstrated that 15% of the patients were non-surgical candidates. If a 68Ga-Dotatate PET/CT scan had not been performed, 28 patients would have been adversely affected, according to the research team. They also reported that the 111In-penetreotide scans were not of uniform quality, due to a wide range of protocols and equipment used by the participating centers. And the 111In-penetreotide scans exposed patients to a higher level of radiation than 68Ga-Dotatate PET/CT scans. “Cancer patient care suffers when patients are either under-staged or over-staged. 68Ga-Dotatate PET/CT scan provides more accurate staging of patients with neuroendocrine tumors. However, its use should be reserved to patients with proven tumors, and not be used for patients who only have suggestive symptoms. We and others have shown a very low diagnosis rate — about 1% — of neuroendocrine tumors with suggestive symptoms only,” Dr. Walker told Applied Radiology. Deppen SA, Liu E, Blume JD, et al. Safety and efficacy of 68Ga-Dotatate PET/CT for diagnosis, staging, and treatment management of neuroendocrine tumors. JNM. 2016. 57:5:708-714. PMID: 26769865. 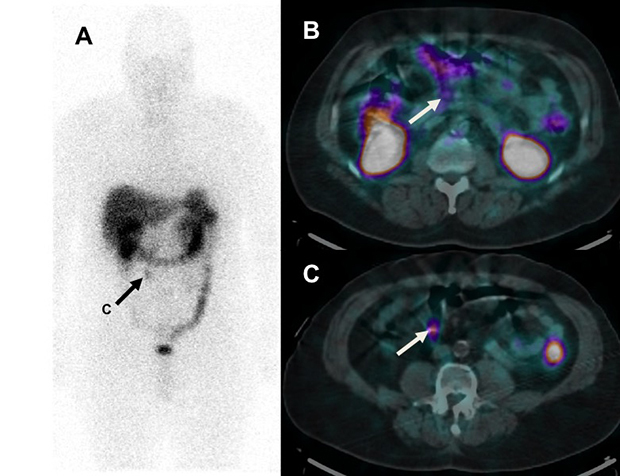 PET/CT radiopharmaceutical agent 68Ga-Dotatate better identifies neuroendocrine tumors. Appl Radiol.